"Women don’t need to find their voice. They need to feel empowered to use it and people need to be encouraged to listen." March is Women’s History Month, and we will be celebrating in style with our annual Women Who Shine awards brunch on March 23! This festive event honors five women who have made stellar contributions to our community. Get your tickets today! 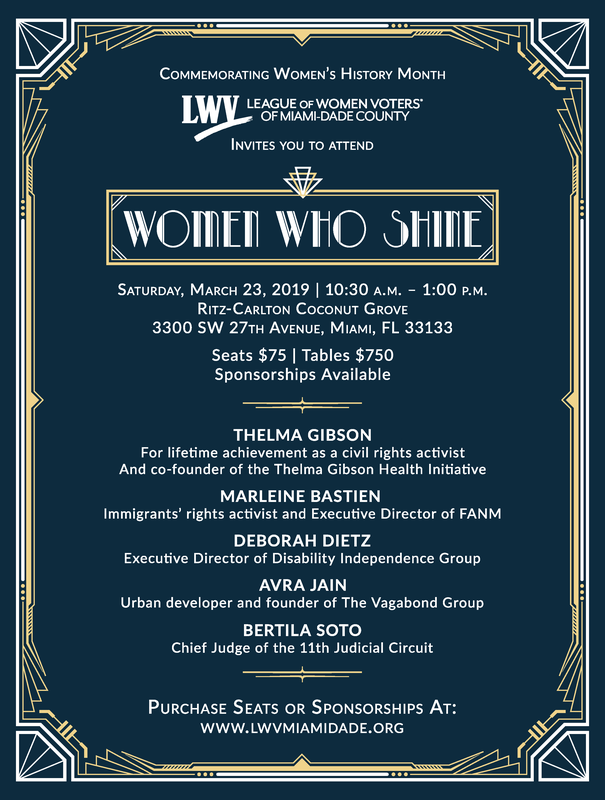 If you have a disability and may require an accommodation to fully participate in Women Who Shine, please email us at info@lwvmiamidade.org request accommodation. Even if you cannot make it, please consider purchasing a ticket that can be donated to an LWVMD student fellow for a truly informative and inspiring experience. 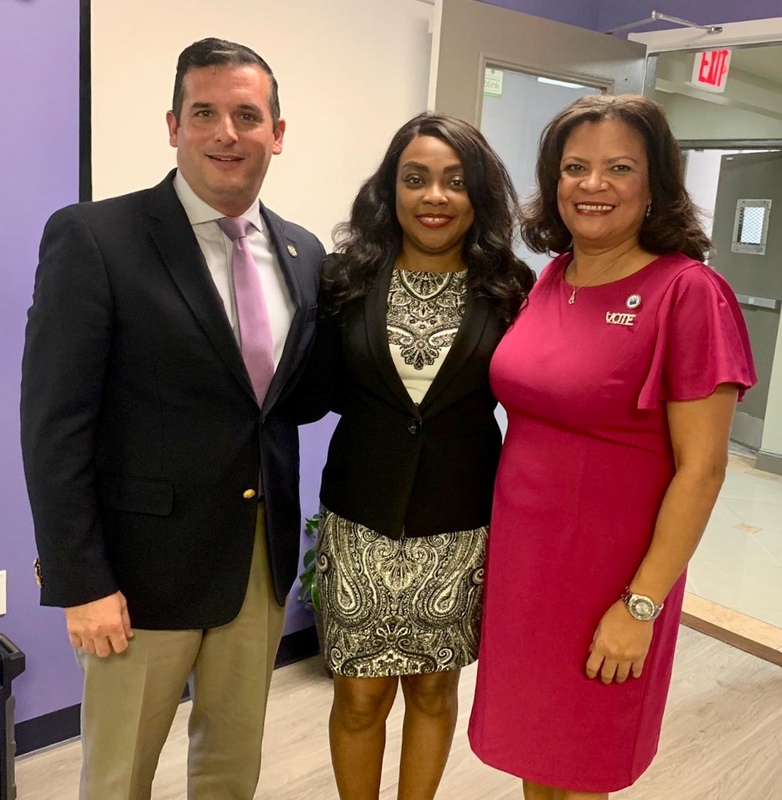 At our Legislative Briefing on February 23, Javier Fernandez, representative for Florida House District 114, and Dotie Joseph, representative for Florida House District 108, shared their perspectives and prio rities for the upcoming legislative session. The two discussed issues including transportation, housing, gun safety reform, water quality, and public school funding. Fernandez emphasized his support for green and sustainable practices, and Joseph highlighted the need for equal pay, paid family leave, and the protection of rights for incarcerated women, especially those who are survivors of domestic violence. LWVMD is heading to Tallahassee on April 9 and 10 to meet up with LWV members from around the state, observe the Florida Legislature in action, and meet with representatives to share our viewpoint on several bills that are in the works for this session. Interested in joining our 2019 Tallahassee delegation? Please let us know ASAP. Registration and hotel rooms will be paid for a certain number of attendees; travel and incidental expenses are the responsibility of individual members. Please email LWVMD as soon as possible if you would like to join our Tallahassee Lobby Days delegation. LWVMD members have helped to engage the community by speaking on League priorities including clean water, environmental protection, and women’s empowerment at recent events. Among the highlights, LWVMD Environment Chair Diane Lockwood spoke out at a March 5 Coun ty Commission meeting on the urgent need for upgrades to the county’s water and sewer infrastructure to make the system more resilient to sea level rise and tropical storms. 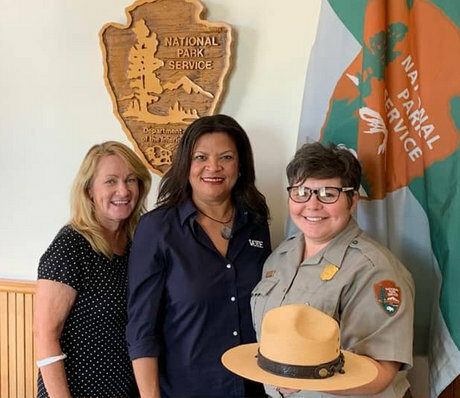 We also visited Biscayne National Park and met with Superintendent Margaret Goodro to share our concerns about the permit renewal for FPL’s cooling towers. 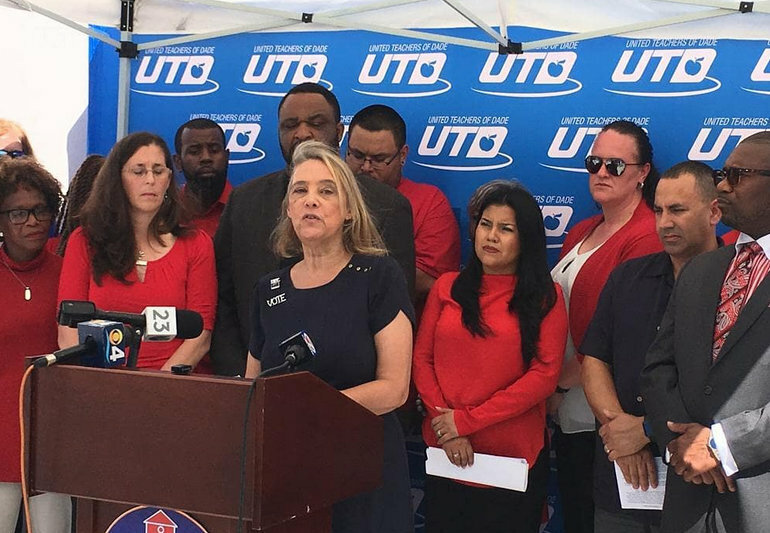 Elections Team VP Barbara Overton spoke at the United Teachers of Dade (UTD) press conference about LWV support of public schools. LWVMD President Marisol Zenteno and board member Teresa Enriquez spoke at the CLEO Institute's Empowering Resilient Women and Girls workshop in Allapattah. Board member Barbara Pierce articulated the League’s support of America’s clean car standards at a press event on March 12. 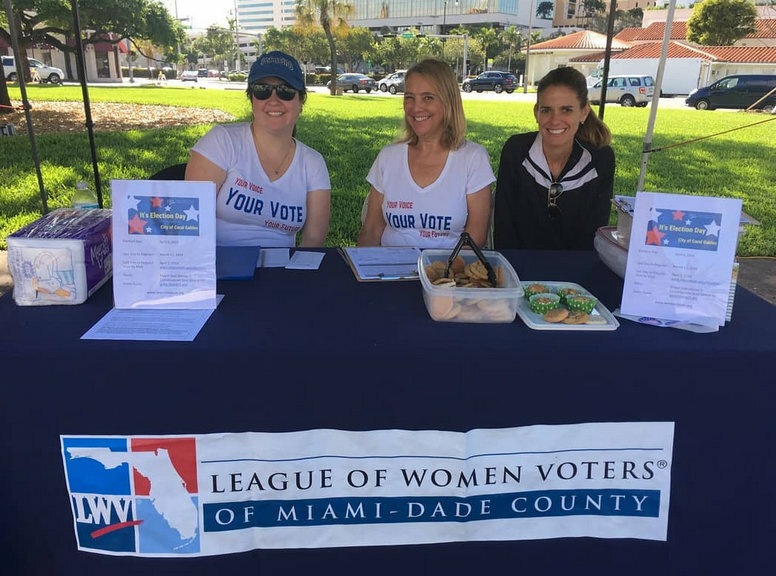 LWVMD also participated in the Candidate Forum for the city of Coral Gables and hosted a voter registration table at the Coral Gables Farmer’s Market. LWVMD members were also out in force to celebrate President Emeritus Susan Windmiller’s recognition for her outstanding public service at Miami-Dade Parks and Recreation’s In the Company of Women event on March 7. While the 2018 general election is now history, Miami-Dade has several local elections this year, including those coming up in Coral Gables and Miami Shores on April 9. If you and/or your family or friends live in these and other municipalities with 2019 elections, get election-ready by visiting the League’s voter information site, vote411.org. To set up and help with Candidate Forums in your town, contact us at elections@lwvmiamidade.org. As we prepare for our Women Who Shine event to honor women from various sectors that are making an impact in the community, hundreds of bills are making their way through the legislative process in Tallahassee. These bills address issues that include election reform, school vouchers, gun safety, and the environment. Medicaid Expansion – Florida legislators are deciding right now whether our state will accept critical federal funds which would provide health care to hard-working families while creating jobs. Yet some state lawmakers want to block this funding, leaving Florida to continue struggling to care for the uninsured. Sign the petition to Florida's legislators today and urge them to expand Medicaid to nearly 600,000 hard-working Florida families who need access to quality health care. BAWN Ban Assault Weapons Now is leading the grassroots movement to put an amendment on Florida's 2020 ballot to constitutionally ban the sale of assault weapons. LWVMD supports this effort and is helping to collect nearly 800,000 signatures so that Florida voters can have their voices heard. If you are with us in this fight, download the petition, print double-sided if possible, and sign. The League of Women Voters of Florida’s Capitol Report provides regular updates on the Legislative Session, and LWVMD is actively tracking this activity, which will directly affect you, your community, and your family. So I urge you to join LWVMD and become an active participant in defending democracy and improving our community. There are many volunteer opportunities, ranging from voter registration and Cocktails and Conversations to Observer Corps and Speakers Bureau. Whatever your passion, there is an issue for you! Even just a few hours a month can make a big difference. Please contact us at info@lwvmiamidade.org to volunteer. Check out the Voter’s Guide before you head to the polls. 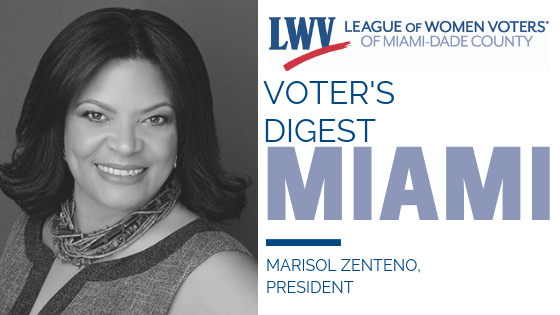 A delegation of LWVMD members will be traveling to Tallahassee to meet with lawmakers from Miami-Dade during the Legislative Session. Email info@lwvmiamidade.org for more information. Saturday, March 23, 2019, 10:30 a.m. – 1:00 p.m.
Join us for our gala annual luncheon celebrating outstanding women leaders who are increasing the well-being and vitality of our community.